Don't let the flowers fool ya...it's November. Just a few late bloomers I presume. And the monarch? I think he missed his charter group flight down south. Hope he's flying stand-by. Hi Kathy, what a great catch. Have you ever seen where they go for the winter? It's amazing how millions of them cling to tall trees and complete cover them. We saw a Nat Geo special a while ago. Just want to wish you and yours a wonderful Thanksgiving, too. You are so clever and witty! Love the photo--we too have been blessed with a wonderful fall--no snow yet, knock on wood--or "touch wood" as the Brit's and Aussie's say. Love that quote. So true. 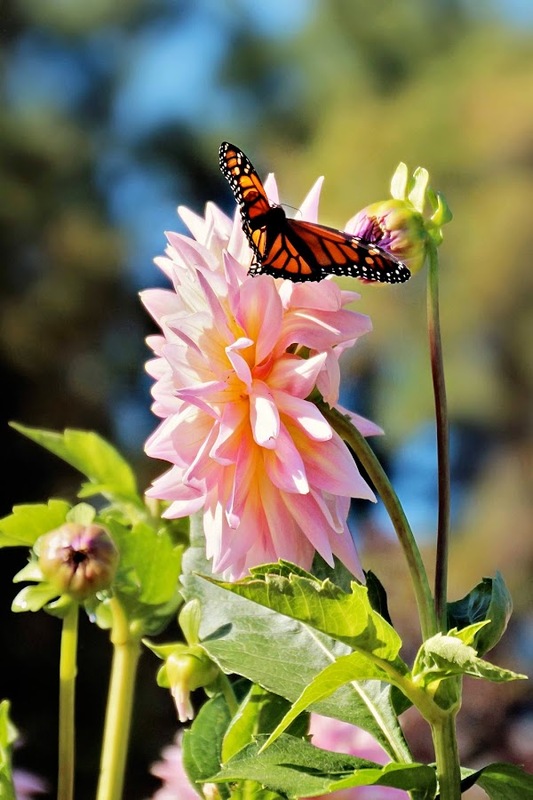 How wonderful to find not only a blooming flower, but also a butterfly in late November! It's a lovely lift on this gray, rainy morning. beautiful!!! love late bloomers, always make you happy! So beautiful! A wonderful photo!